When I saw Lush’s Holiday items, I couldn’t resist buying a few, or six. Luckily, they are still in stock so hurry and place orders so they reach your door in time for Christmas! I have to start with my favorite product of this haul, Snowman. 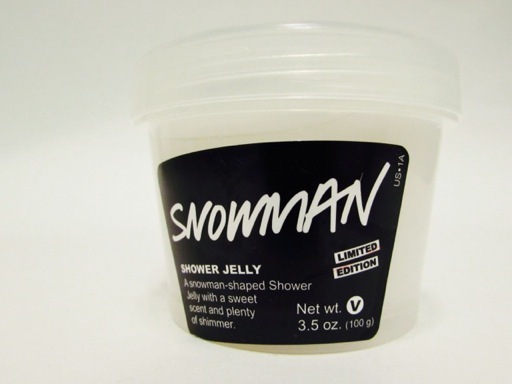 I had never tried a Lush Shower Jelly before and couldn’t understand how a snowman could fit in a little container. 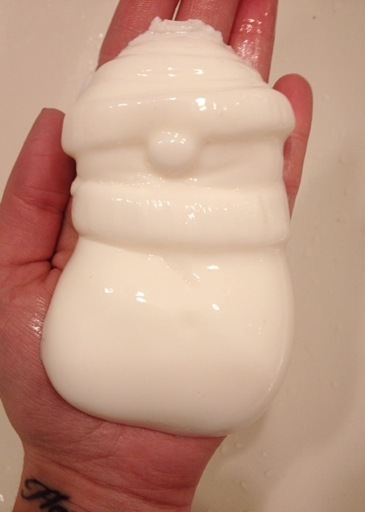 But this cute, wiggly Snowman does in fact come out of that container without losing his shape. It’s MAGIC! Surprisingly, Snowman doesn’t have a Christmas scent, but a fruity scent that I really enjoy. He contains carrot infusion and smells like Lush’s Carrot Soap that comes out around Easter. Snowman is definitely an affordable gift option at $6.95. Great for kids big or small! It’s vegan too. Speaking of cute…look at this prickly, sparkly creature. I don’t know what Hedgehogs have to do with Christmas, but who cares! 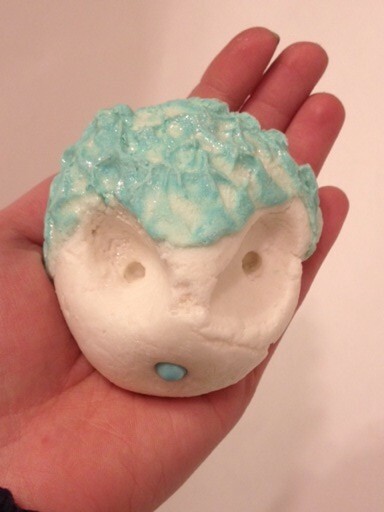 The Christmas Hedgehog is a bubble bar that creates silky waters scented with soothing lavender and rose for $7.25. I’m not a huge fan of this scent, but I don’t typically love floral fragrances. My skin gets so dry in the winter so for $7.95 I decided to purchase this candy shop smelling, pink angel which contains shea butter, cupuaçu butter, and cocoa butter. Snow Fairy Sparkle is a massage bar that melts into the skin. It also has a fondant center with silver luster. (I haven’t hit the center just yet.) I really like the scent of this product as well, but I was disappointed in the bar’s appearance because mine looks sloppier than the photo featured on the Lush website. Looking for something merry that’s not a bath product? 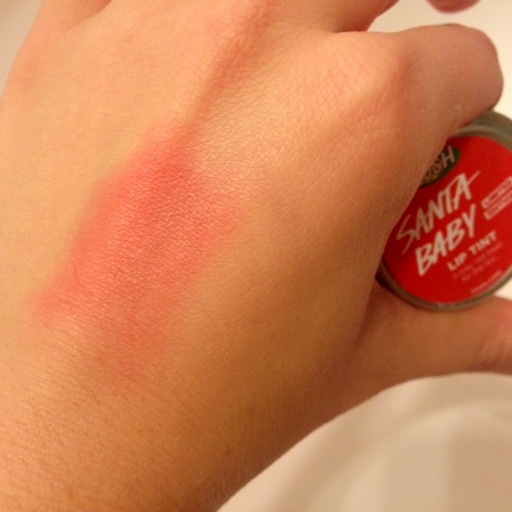 Santa Baby Lip Tint gives a red pout and smells like cola. I’m a Coca-Cola addict, so that was a major selling point for me. This vegan lip product costs $8.95. Lush also offers a Santa’s Lip Scrub for the same price and cola-flavored too. 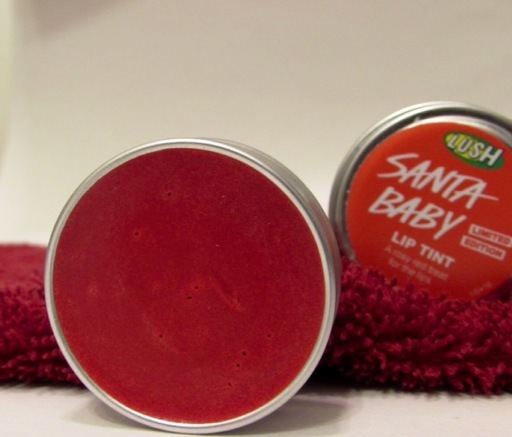 Santa Baby is sure to stain your lips and can also be used as a cheek stain. Which brings me to a buyer’s beware: it can stain your finger. Additionally, you don’t want to apply this too quickly or without a mirror because that can result in looking like a child that ate a messy red popsicle. Lush Dusting Powders are pretty nifty products that have multiple uses. You can use them on your skin, sheets, rugs, etc. 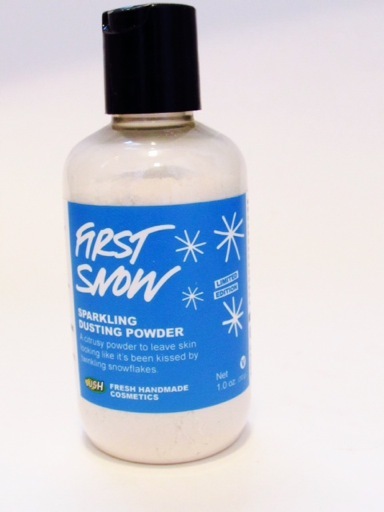 First Snow is a super shimmery Limited Edition version with a fresh, citrus scent. The glitter in this product is plastic free and eco-friendly. 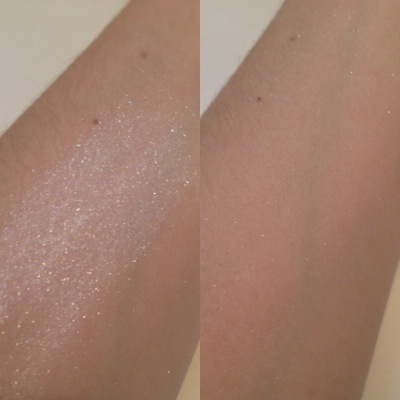 It’s incredibly shimmery when first applied, but isn’t as intense once blended all over skin. First Snow costs $7.95. Reindeer Soap has my favorite scent from this entire purchase. 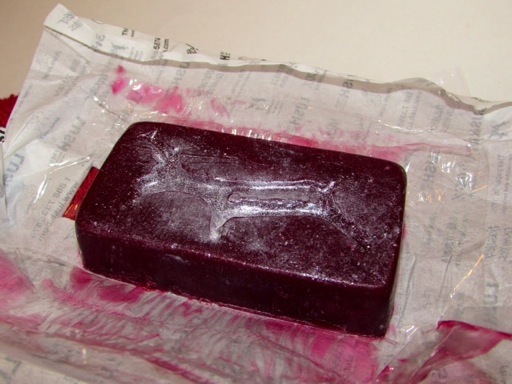 This reindeer imprinted bar has silver shimmer on top and smells like Lingonberry. I don’t know what Lingonberry is, but it sure smells delicious. It’s a perfect example of how unique Lush’s scents are. (I’m decent at describing scents until I have a Lush product to my nose.) 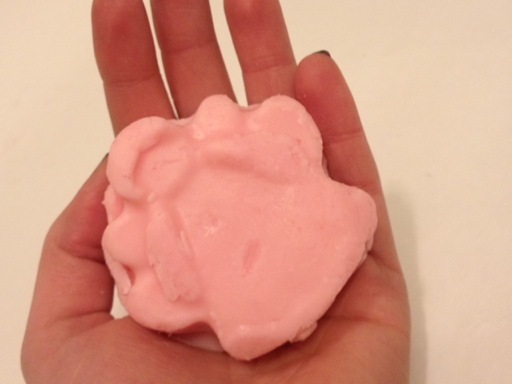 This vegan soap is $6.95 and a great Secret Santa gift idea! I highly recommend checking out all of Lush’s Christmas products. There are so many great options for kids, sisters, moms, co-workers, bosses, friends…everyone! If you’re participating in a Secret Santa with only a $10-$15 limit, gifts like these can make a great impression. 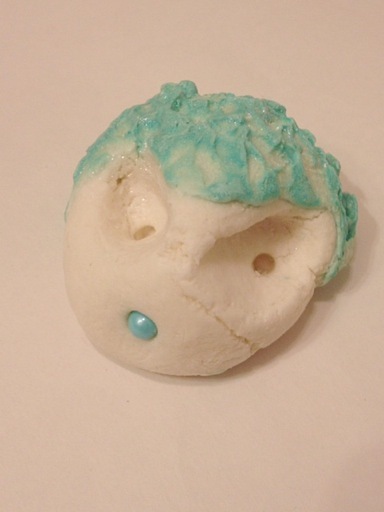 Seriously, click the link and go check out The Melting Snowman.